Chondroitin is a chemical found primarily in joint cartilage. A form of chondroitin, known as chondroitin sulfate, is manufactured from animal byproducts and sold as a dietary supplement to aid in the treatment of osteoarthritis. Chondroitin sulfate is often co-formulated with glucosamine sulfate, a naturally occurring compound found in joint fluid, under the presumption that they can slow or even reverse the loss of joint cartilage. Chondroitin supplements are intended to enhance the shock-absorbing properties of joint cartilage and block enzymes that break down cartilage. Unlike other dietary supplements used to treat arthritis, chondroitin has undergone a significant amount of clinical research to evaluate its safety and effectiveness. Starting in 2004, a multicenter trial funded by the National Centers of Complementary and Integrative Medicine (a department of the National Institutes of Health) and the National Institute of Arthritis and Musculoskeletal and Skin Diseases aimed to evaluate the purported benefits of chondroitin sulfate and/or glucosamine sulfate. The first two-year study aimed to assess whether chondroitin and/or glucosamine could alleviate the pain of knee osteoarthritis. The second two-year study was designed to evaluate whether the supplements could reduce the loss of joint cartilage in people with knee osteoarthritis. The first study, completed in 2006, involved 1,583 people from nine different clinics who were given either chondroitin sulfate, glucosamine sulfate, a chondroitin/glucosamine combination, the anti-inflammatory drug Celebrex (celecoxib), or a placebo. To evaluate pain, the researchers used a standardized questionnaire known as the Western Ontario and McMaster Universities Osteoarthritis Index (WOMAC) pain and function scale. After two years of treatment, people who took chondroitin and/or glucosamine had no better outcomes than those who took either a placebo or Celebrex. The follow-up study, completed in 2008, involved 572 people from the original GAIT study who were assigned one of the five same treatment regimens for two years. To evaluate cartilage loss or growth, the researchers used X-rays to measure the space in the knee joints. After two years of treatment with glucosamine and/or chondroitin, there was no evidence that cartilage loss was slowed when compared to a placebo or Celebrex. Both of these results were confirmed in yet another two-year study, completed as part of the GAIT trial in June 2010, in which chondroitin and/or glucosamine proved no better at providing pain relief or altering the rate of cartilage loss compared to a placebo. The GAIT trials were able to establish that chondroitin sulfate was generally well-tolerated and safe for long-term use. Side effects are relatively mild and most often included stomach upset and nausea. Less commonly, bloating, diarrhea, constipation, headache, swollen eyelids, leg swelling (edema), hair loss, skin rash, and irregular heartbeat (arrhythmia) have been reported. Some of these may be caused by a hypersensitivity to the beef or pork albumins in the chondroitin extract. Anaphylaxis (a potentially life-threatening, whole-body allergy) is rare but may occur in people with a known allergy to a sugar molecule called alpha-gal found in pork and beef. Others may experience an allergic response to chondroitin derived from fish or poultry sources. Although there have been suggestions that chondroitin supplements could potentially transmit bovine spongiform encephalopathy (mad cow disease) from infected cows, there has been yet to be any documentation of this occurring. Chondroitin sulfate may slow blood clotting and should be avoided if you have a bleeding disorder or are taking anticoagulants like Coumadin (warfarin) or antiplatelet drugs like Plavix (clopidogrel). 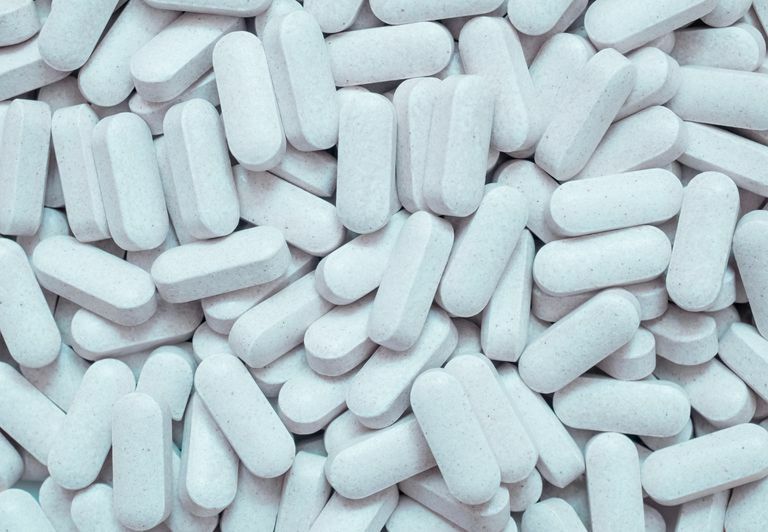 Chondroitin supplements may also promote gastric bleeding in people who regularly take nonsteroidal anti-inflammatory drugs (NSAIDs) like aspirin or Advil (ibuprofen). Stop taken chondroitin at least two weeks before scheduled surgery to avoid excessive bleeding. Chondroitin sulfate is available in capsules, tablets, and powders. The typical dosage used in clinical trials was between 800 and 2,000 milligrams (mg) per day, taken in two to three divided doses. Although the supplement can be taken with or without food, it may be better with food if you happen to experience stomach upset. There are also co-formulated topical ointments containing chondroitin sulfate and other ingredients (such as glucosamine, camphor, and shark cartilage) that are marketed for joint pain relief. While considered safe, there is absolutely no evidence that any of these topical products work. Dietary supplements are largely unregulated in the United States and can vary in quality from one brand to the next. To ensure quality and safety, only choose supplements that have been tested and certified by an independent certifying body like the U.S. Pharmacopeia (USP), ConsumerLab, or NSF International. In this way, you can be better assured that the supplement contains the amount of chondroitin listed on the product label. With that being said, chondroitin is not a uniform product and can vary in composition based on the animal it was derived from. Most manufacturers will use chondroitin derived from bovine (cow) trachea or pig's ear; others will use shark, bird, or fish cartilage. Always check the product label to identify the animal source, especially if you have a known allergy to beef, pork, poultry, or fish. You can also check to see if the supplement was manufactured in accordance with the Good Manufacturing Practices (GMP) established by the U.S. Food and Drug Administration (FDA). With the exception of a few larger manufacturers, this compliance certification is rarely obtained in the supplements industry but is another sign of product quality and safety. Clegg, D.; Reda, D.; Harris, C. et al. Glucosamine, Chondroitin Sulfate, and the Two in Combination for Painful Knee Osteoarthritis. N Engl J Med. 2006; 354:795-808. DOI: 10.1056/NEJMoa052771. Sawitzke, A.; Shi, H.; Finco, M. et al. The effect of glucosamine and/or chondroitin sulfate on the progression of knee osteoarthritis: a report from the glucosamine/chondroitin arthritis intervention trial. Arthritis Rheum. 2008 Oct;58(10):3183-91. DOI: 10.1002/art.23973. Sawitzke, A.; Shi, H.; Finco, M. et al. Clinical efficacy and safety of glucosamine, chondroitin sulfate, their combination, celecoxib or placebo taken to treat osteoarthritis of the knee: 2-year results from GAIT. Ann Rheum Dis. 2010 Aug;69(8):1459-64. DOI: 10.1136/ard.2009.120469. Should You Take Osteo Bi-Flex for Your Joint Pain?